One aspect of the busy life of St Joseph’s College is that students are given many opportunities to embrace. Recently, I visited Valdocco Campus for the presentation of the Year 9 projects relating to ‘My Town’. Students have been working diligently over a number of Friday sessions in local suburbs to investigate issues pertinent to the respective locations. Using a variety of ICT techniques, students demonstrated great skills in being able to create iMovies which provided a snapshot of the issues through interviewing local residents. A decision has been made to bring in a new uniform from 2019. Further details of transition timelines for current students will be communicated later in the year. The plan is that Year 7 students who are enrolled for 2019 will be in the new College uniform. Consultation processes are in place and there will be an opportunity for parents, staff and students to contribute. Examinations are in full swing for most year levels. I trust the exams provide students with the opportunity to display what they know and that they are rewarded for their hard work. The ‘Lighthouse Program’ was held this week which brought together staff, students and parents from a number of schools. 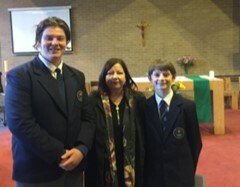 Thanks to Ms Alex Bantock who led the Lighthouse Program this Semester and all of our Year 10 students who acted as mentors to dozens of students from our parish primary schools. I draw your attention to the Year 8 Music Soiree being held in Chieri at 6pm on Thursday 21 June as an opportunity to support your sons in their musical journey. On Wednesday 20 June, participants depart for the Kiribati Immersion. I wish Dylan Price, Tracey Ashton, Kerrie Stone, Tom Murphy and the 12 Year 11 students all the best for their experience. Recently we held our mass in the Belgrave Parish. I would like to acknowledge all the staff, students and families who participated. Father Jim Acreman and Father Geoff McIlroy celebrated mass and Miss Bronwyn Dean prepared the students. Our condolences are extended to Mrs Helen Giokas-Smith. Helen’s husband, Michael Smith, died following a long illness.